I love the sprayers in FlowWorks at the Children’s Museum of Houston. Nothing quite like spraying water around to help beat the Houston heat, right? But why does putting your thumb over the nozzle make the water spray faster? Well, in a normal hose, the diameter of the hose at the water source and the diameter of the water at the nozzle is about the same, so the pressure throughout the hose remains constant – the same volume of water coming into the hose can leave the hose at almost the same rate. But, by placing your thumb (or a smaller nozzle) over the end of the hose, you decrease the diameter on the nozzle end. So, the water begins backing up down the hose (more coming in than can go out), increasing the pressure of the water in the hose. That increased pressure pushes the water out the nozzle with more force and so you get a water spray. Attach a hose with two female ends to the end of your garden hose. This is the same kind of hose used for clothes washers and hot water heaters. 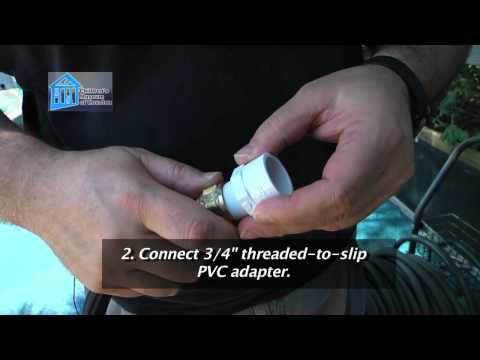 To the other end of the hose you just attached to the garden hose, hook up a 3/4″ thread-to-slip PVC adapter. Drill a hole into a PVC cap. Mark the size of the hole on the cap so you don’t get them confused. PLEASE make sure to have an adult help you with this part. Put the cap on tight to a 8″-12″ piece of PVC pipe. Repeat 3-4 for each size hole you want to test. I STRONGLY recommend you actually change out the whole cap-and-pipe assembly for each test, as you really want to have the cap on tight. For some of the smaller holes, the pressure can build up to the point that the cap will pop off if not on tight enough. Now you’re ready to test! Slide a PVC pipe and cap into the PVC adapter attached to the hose. Mount the assembly in place. I used a plastic sawhorse, but a table, chair, or stool will do. The key is to know the exact position from where the water spray begins. Place a marker at the furthest point the water reaches. Measure the distance from the test assembly to your marker. Repeat steps 3-6 two more times so you can get an average distance. Remove the pipe and cap. Repeat steps 1-8 above for each additional diameter hole you plan to test. Which hole sprayed the furthest? In my video, we only tested 3 holes. The data we show was our average. But you may find something interesting happens when you get to really small holes – the distance starts to decrease! Why? Well, water experiences friction just like everything else. Friction is a force that opposes motion and makes things slow down, like a baseball player sliding to a stop. In the case of the hose, if the holes get too small, even with all the pressure behind it, there is so little water coming through that friction has a much greater effect and so the water spray doesn’t go as far. You can see this just by going back to the start of this and placing your thumb over the end of a garden hose: there is a “sweet spot” where you get the best distance. If you cover the hose any more or less with your thumb, the spray doesn’t go as far.